I dropped my iPhone and now it’s broken. I can’t get to the Home screen or launch apps or anything. I took the phone to an Apple Store and they said the phone can’t be repaired. I need to get a replacement phone. But that means I will lose all the stuff that’s on the iPhone now, including over a thousand photos. Isn’t there something I can do to save my stuff? After asking the person a few questions, I confirm what I had already suspected. There is very little hope of data recovery. Certainly there’s not any fast and easy solution. Which is too bad, because it could have been soooo simple. Given how many people fail to back up their Macs, I suppose I shouldn’t be surprised that such failures extend to iOS devices. But I remain surprised. At least with Macs, there is the “excuse” that local backing up requires the purchase of additional hardware, typically an external drive at least as large as the Mac’s drive. Launch iTunes on your Mac. Connect your iOS device to your Mac via a USB cable. Select your iOS device from iTunes’ Devices list. And click the Sync button. That’s it. Just remember to do this regularly, so you always have a recent backup. Still not simple enough? No problem. The Summary screen for your iPhone in iTunes should include an option to “Automatically sync when this iPhone is connected.” With this enabled, you don’t even have to launch iTunes or click the Sync button. Just connect your iOS device to your Mac and the rest is handled automatically. In addition to backing up your iOS device, syncing (as its name implies) syncs data between your iOS device and your Mac. This means that new apps or music or whatever that you’ve added to iTunes on your Mac will correctly transfer to your iOS device—and vice versa. If you want to manually back up without syncing, you can do so at any time. Connect your iOS device to iTunes. From the Backups section of the device’s Summary screen, select Back Up Now. Done! Use the Backups and Options features of your iOS device in iTunes. If you have an iCloud account with sufficient storage allocated, you can back up your iOS device to iCloud. While this is not quite as complete as an iTunes backup (see this Apple article for details), it saves your most critical data, including Camera Roll photos. With an iCloud backup, you don’t have to connect your iOS device to your Mac. Instead, from your iPhone or other iOS device, go to Settings > iCloud > Storage & Backup. If it is not already enabled, enable iCloud Backup. Next, click the Back Up Now button. Finished. Subsequent backups can be handled automatically. If your iOS device is idle, connected both to a power source and a Wi-Fi network, the device should back up to iCloud once a day. This can typically be done when charging your iOS device. Otherwise, you can perform a manual backup whenever you want. 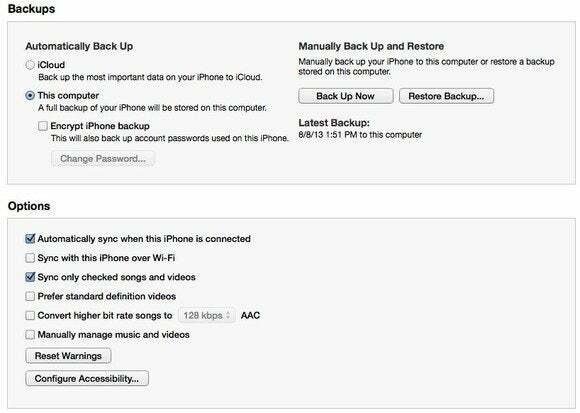 iTunes and iCloud backups need not be mutually exclusive. You can get the best of both worlds, automatically backing up to iCloud and manually backing up to iTunes (as detailed in the above cited Apple article). If you enable Photo Stream via the iCloud settings on your iOS device, your Camera Roll photos are automatically saved to iCloud. You can retrieve them from the Photo Stream section in iPhoto on your Mac. This serves as a partial backup, one that would have definitely lessened the dilemma of the caller at the top of this column. However, there are limits to what Photo Stream saves. It does not save videos and it saves only the most recent 1000 photos. As such, even if you routinely back up your iOS device and have Photo Stream enabled, I strongly recommend that you also regularly import your Camera Roll contents to your Mac. This ensures that you have all your Camera Roll photos and videos saved in an easily accessible format. To do such an import, connect your iOS device to your Mac and launch iPhoto. From here, you will be prompted to import your Camera Roll contents. If the caller above had a current backup of her iPhone, there would have been no crisis to resolve. When she set up her replacement iPhone, she would select to restore from an existing backup, either from iTunes on her Mac or from iCloud. Alas, the caller did not have any Apple-supported backup. So there was nothing to restore. In situations such as this, is there any hope to recover photos or other data from a damaged iOS device? Possibly. If you’ve uploaded your photos and videos to Dropbox, that would help. Otherwise, there are applications that are potentially able to recover the contents of a damaged iOS device. Alternatively, there are companies that will attempt a “last resort” recovery—for what is almost certainly a hefty fee. But neither of these options guarantee success. And they won’t help if your iPhone was lost or stolen. That’s why the best advice, as always, is to back up your iOS device. Do it right now—and continue to do so on a regular basis.